address of recipient (only for send direct purchases) - remember to also fill this in for your alternative delivery address. A card from 'the bump' with a sweet message to it's mummy. Perfect for a birthday or even on a first mother's day! "I might just be a bump but I love you more than you will ever know. I can't wait to meet you mummy." 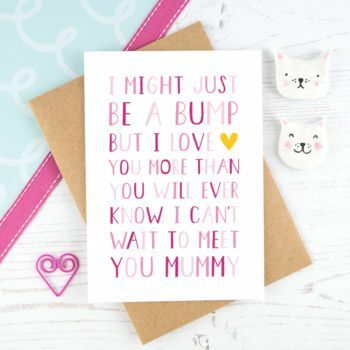 A perfect little card to let the expectant Mother know that she is loved on Mother's day, her birthday or just because. This card is also available to send direct, which is perfect if you are running short of time or live overseas. It will also save you money on a stamp! If sending direct please enter the address of the recipient in the box on this page and at the checkout (so that postage calculations can be made if necessary) otherwise it will be sent to the address supplied on the dispatch note. I can hand write your message inside too! Please note that your message will be written exactly as you enter it into the box and will be sent in the envelope provided with the card. Please note that personal messages can only be written inside when the send direct option has been selected. It is available in 3 different colourways, please see images for details. This product is dispatched to you by Joanne Hawker.